A few weeks ago, J- & I received an invitation to Cat Welfare Society’s Annual General Meeting via facebook. After some thought, we decided to approach Veron (Vice-president of CWS) and offered to sponsor refreshments for the AGM. She was more than happy to oblige and informed us that the estimated number of people we should cater for would be twenty. I spent the past week tossing cupcake flavors around in my head – what if people found vanilla boring? what if someone doesn’t like chocolate? – estimating the ingredients I would have to buy and fretting about the presentation of the food. Thankfully, inspiration struck two nights ago and I busied myself with making little sugarpaste flowers. As I was keeping my tools, I had this huge urge to make cats.. Well, I’ve always been a little too ambitious.. thus the single cat in the picture! 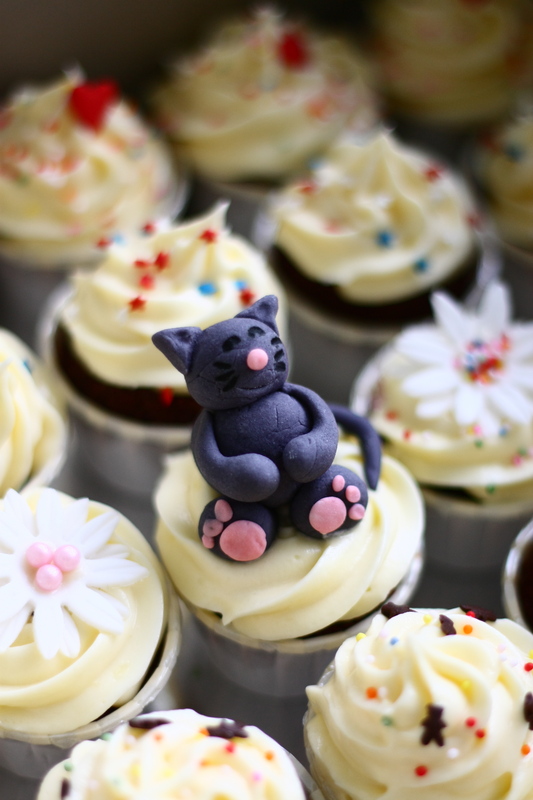 Initially, I planned to make fifty mini cupcakes and some cat-shaped sugar cookies for the AGM. But as I rolled out my cookie dough last night, I realized that I might not be able to make enough cookies – I only had enough dough for ten. 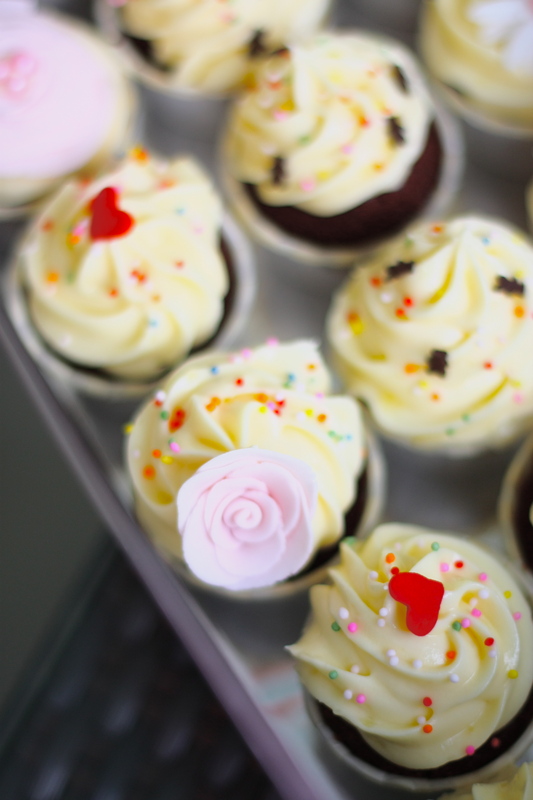 Panic struck me and I ran through a list of things that I could make… More cupcakes? Nah. Cake balls? What, more cake? Nah. I finally decided on Chocolate Chip Cookies; the crispy-chewy, golden brown kind made with tons and tons of chocolate chips. I rushed to the mart after class to buy the last minute ingredients for the cookies and the three hours afterward spent in the kitchen passed too quickly. The cab got us to The Central in one piece and thankfully without any mishaps. (Try cabbing with cupcakes or cakes and you’ll understand!) It took us a while to find the room where the AGM was held and set up the tier. Looking at the number of people in the room and thinking about the amount of people that were going to arrived.. I was afraid to have over baked… and I was also afraid to have under baked. Luckily, I seem to have gotten the number just right. The cat-shaped cookies went first, people stopped to admire the sugarpaste kitty and by the end of the meeting, all the cookies were gone. We ended up having to persuade some people to finish up the last of the cupcakes but by the time we left the board room, I only had the boxes I’d brought the cupcakes in, the cake stand and a huge smile on my face.